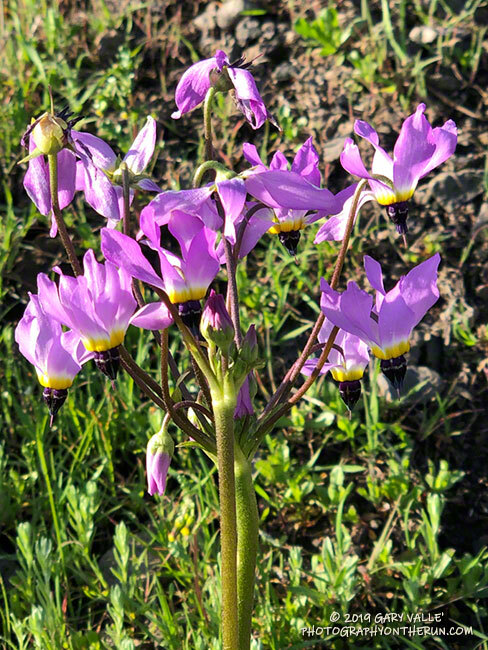 Chaparral nightshade along the Satwiwa Loop Trail at the beginning of my run. 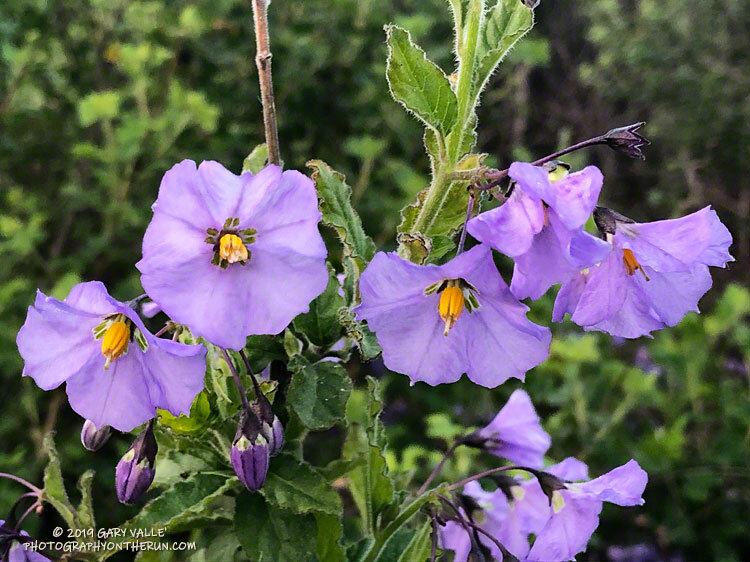 Although nightshade is poisonous, it is in the same genus as eggplant, potato and tomato. March 24, 2019. 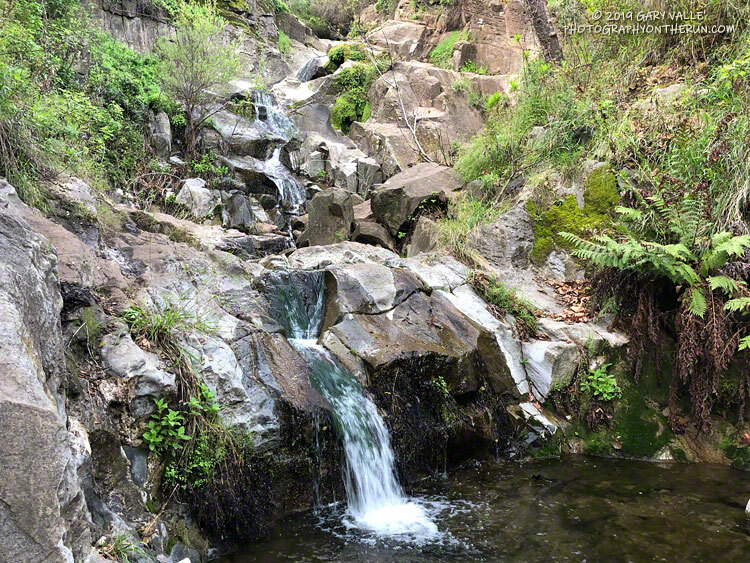 Winter's rains have temporarily rejuvenated the cascading waterfall in Upper Sycamore Canyon. The cascade is just off of Danielson Road, about 1.7 miles from the Satwiwa Wendy Drive trailhead. March 24, 2019. 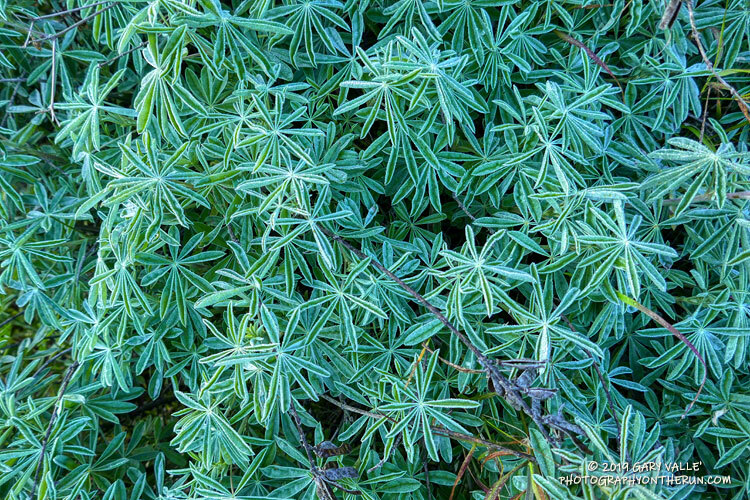 Silver lupine along Danielson Road, on the way up to the Old Boney Trail. 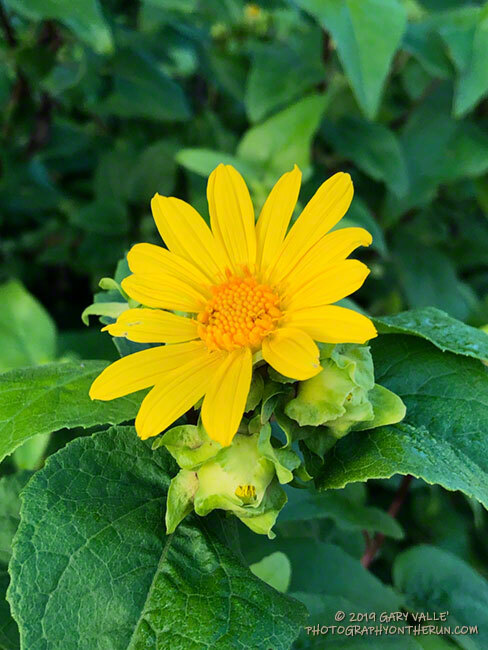 Canyon sunflower, one of the four species of sunflowers seen in Pt. 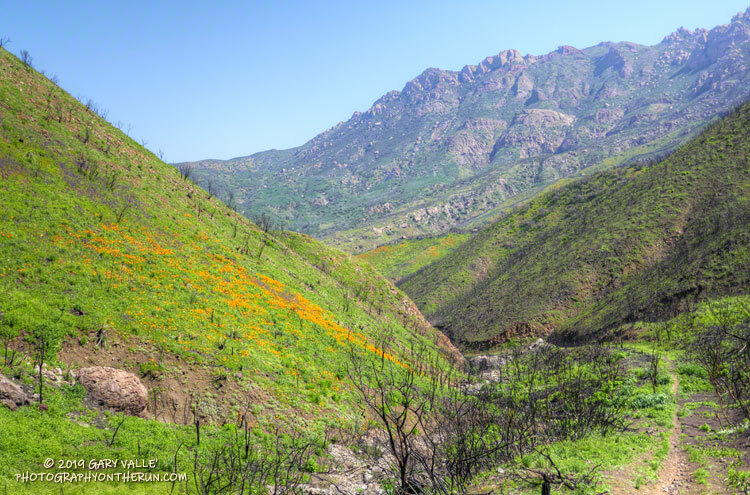 Mugu State Park and the Santa Monica Mountains. March 24, 2019. 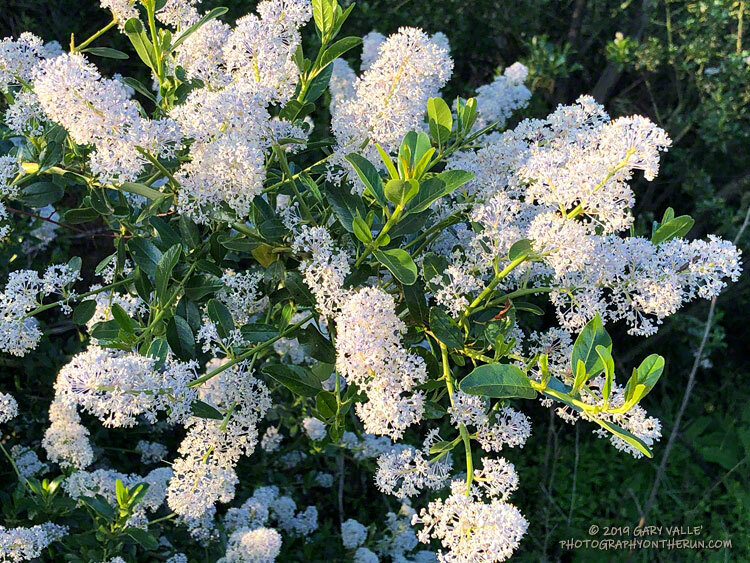 California lilac, aka Greenbark Ceanothus, was blooming in many areas. March 24, 2019. 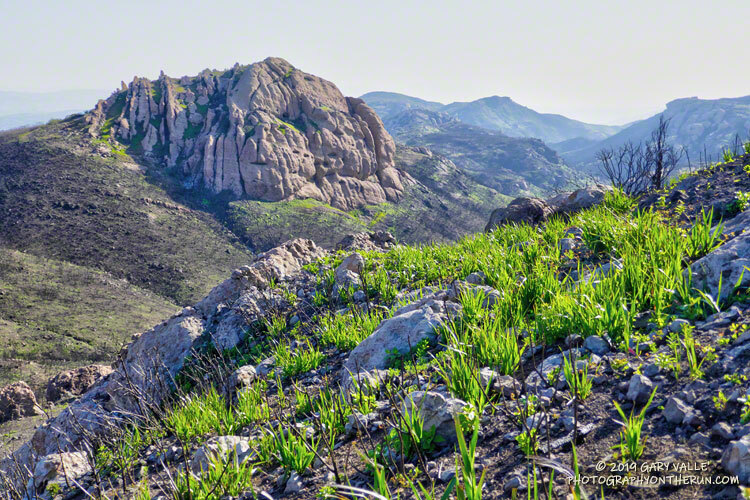 Working up through the crags of chunky volcanic rock on the north side of Boney Mountain. 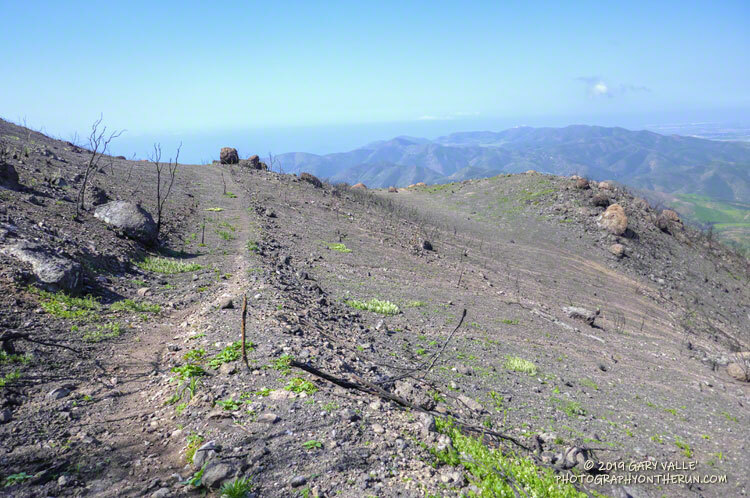 View down the Western Ridge/Mountaineer's Route on Boney Mountain to Satwiwa. The route follows along the westernmost ridge on the north side of Boney Mpuntain. 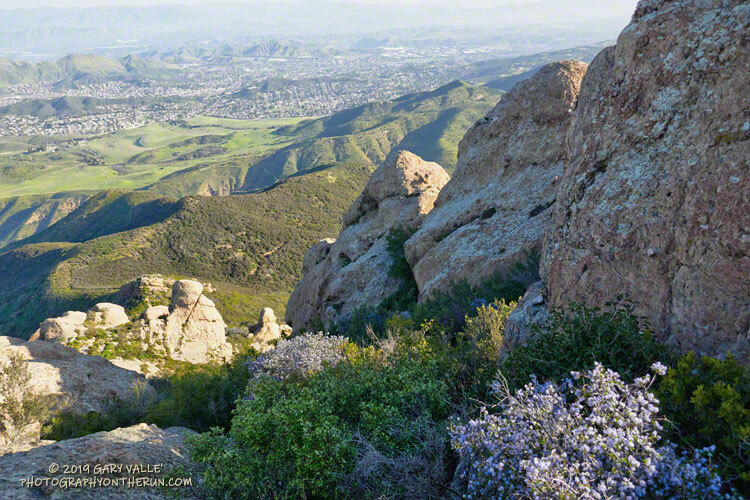 View toward Conejo Mountain, Oxnard Plain and Ventura Mountains. 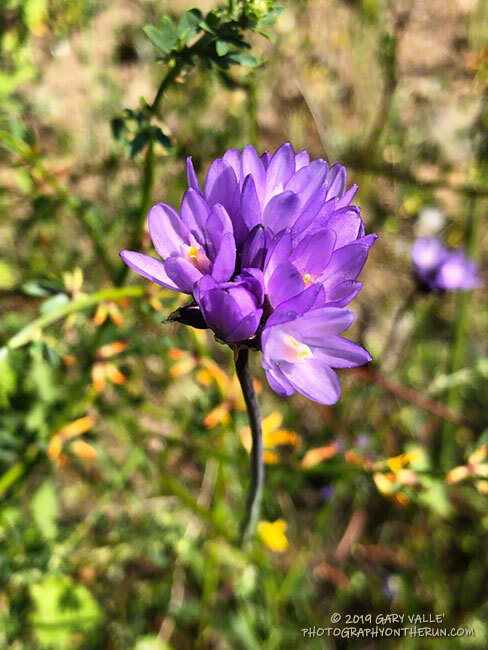 There were still many shooting stars blooming on the slopes of Boney Mountain. March 24, 2019. 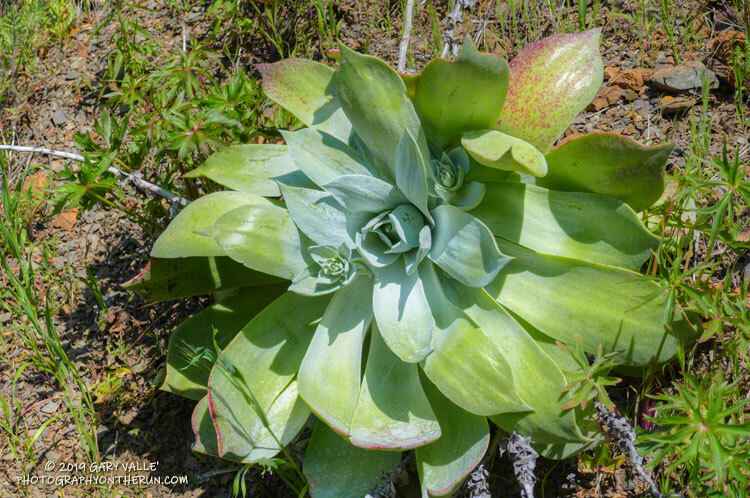 Padre's shooting star on Boney Mountain. March 24, 2019. 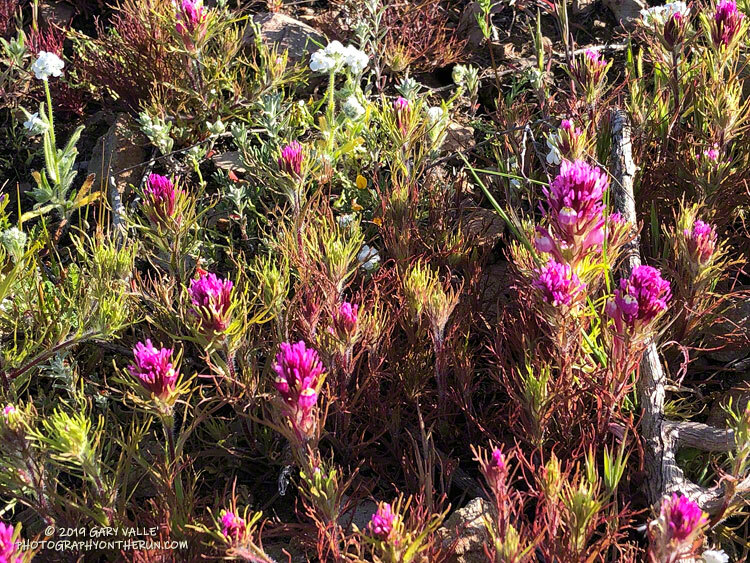 Owl's Clover on Boney Mountain at the top of the Western Ridge/Mountaineer's Route. March 24, 2019. Big Dome from the north slopes of Tri Peaks. Sandstone Peak is in the distance. Hazy view toward Sandstone Peak from the shoulder of Tri Peaks. March 24, 2019. 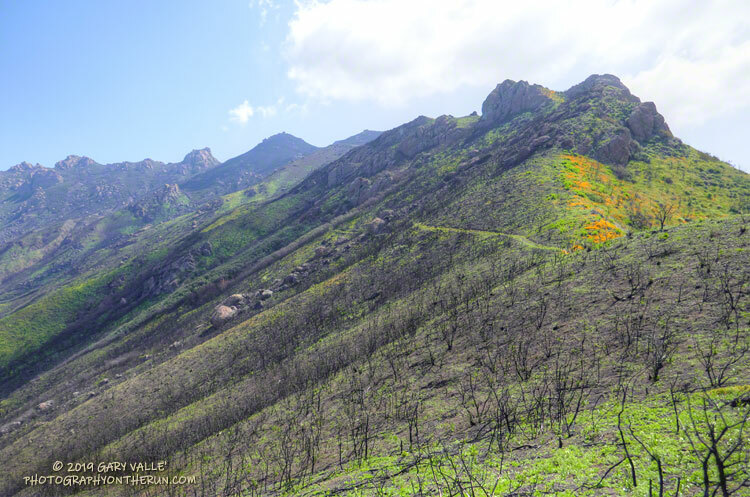 Heavy Winter rains following the Woolsey Fire severely eroded numerous trails in the western half of the Santa Monica Mountains. 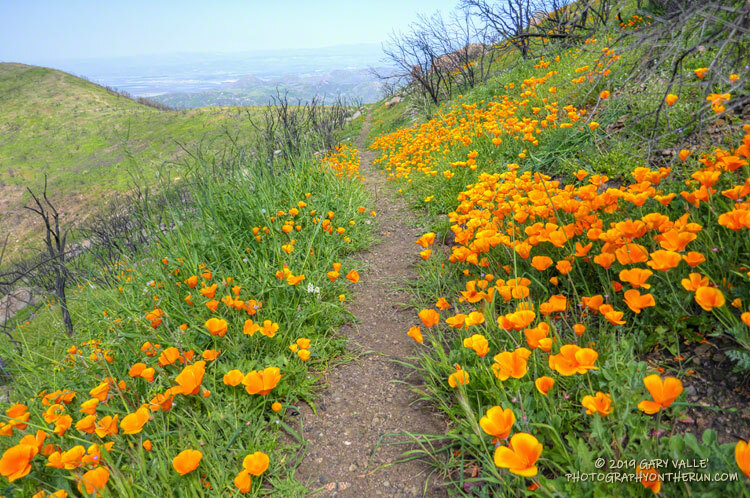 This is the Tri Peaks Trail. March 24, 2019. 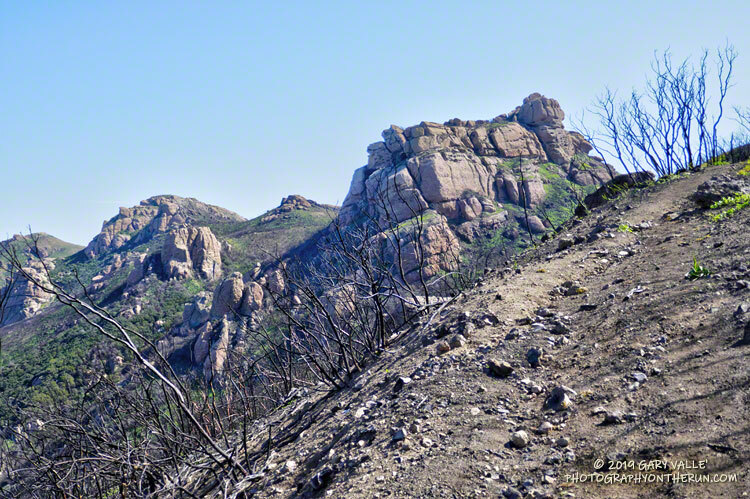 The Backbone Trail, west of Sandstone Peak. March 24, 2019. 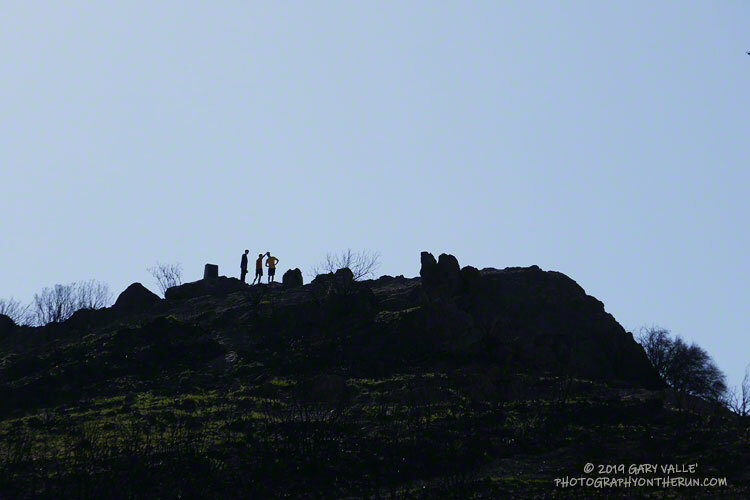 Hikers on the summit of Sandstone Peak (about 3111'). 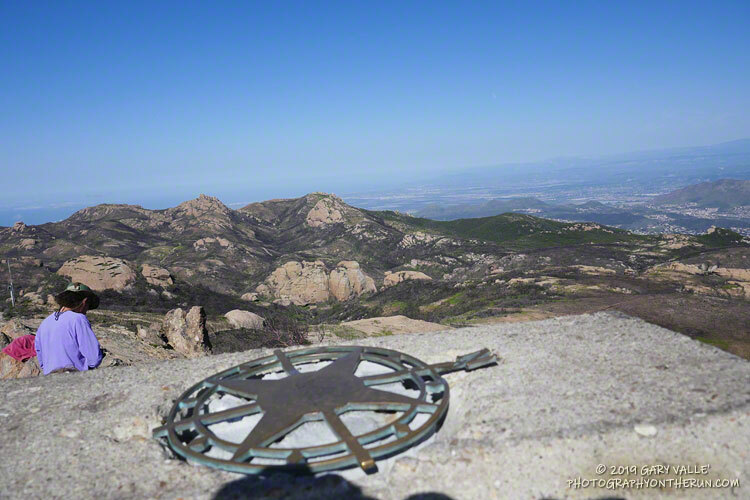 The peak is the highest in the Santa Monica Mountains. 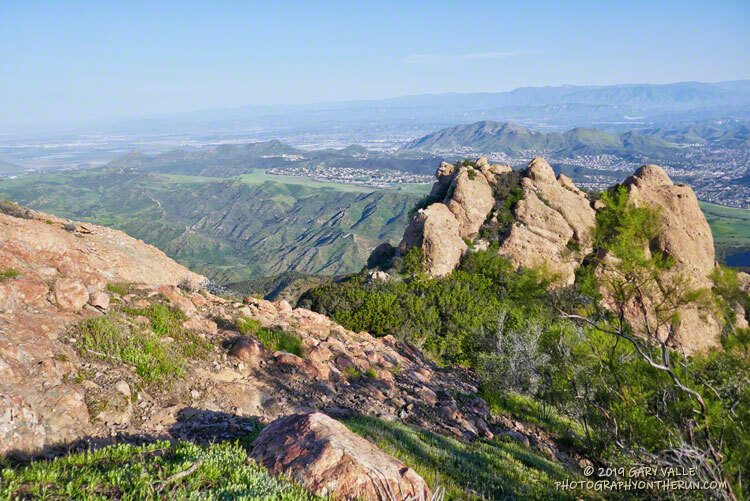 Tri Peaks (left) and Big Dome from Sandstone Peak. The top of Boney Mountain's Western Ridge/Mountaineer's Route is between the two peaks. 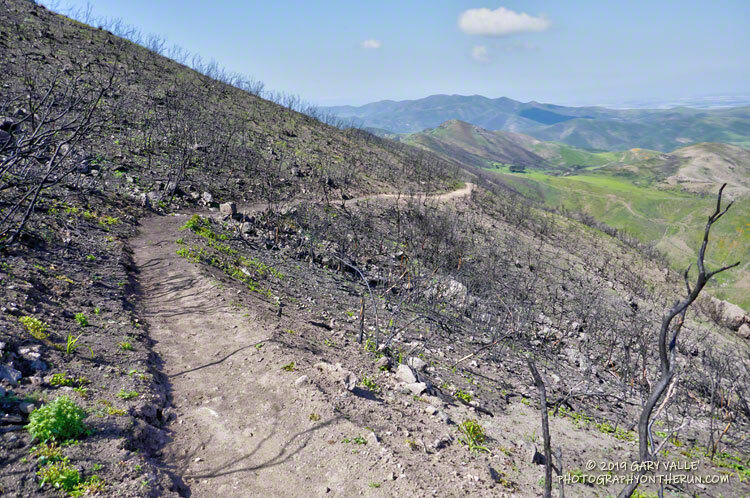 Badly burned area along the Backbone Trail, near the top of the Chamberlain Trail. March 24, 2019. 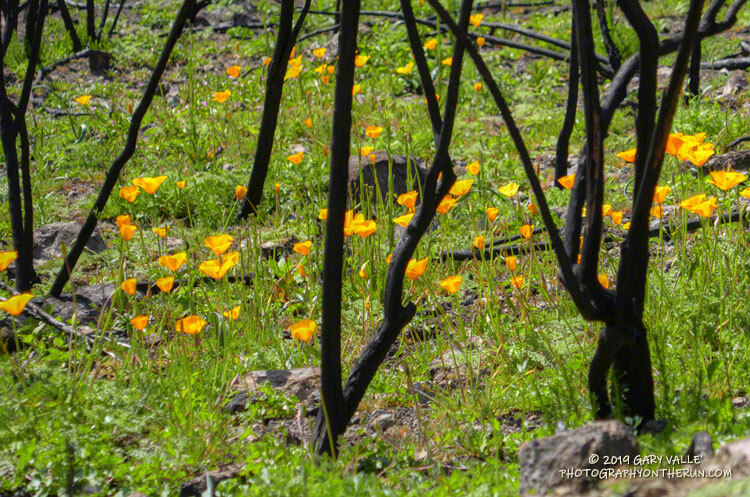 Poppies and burned chaparral along the Backbone Trail. March 24, 2019. 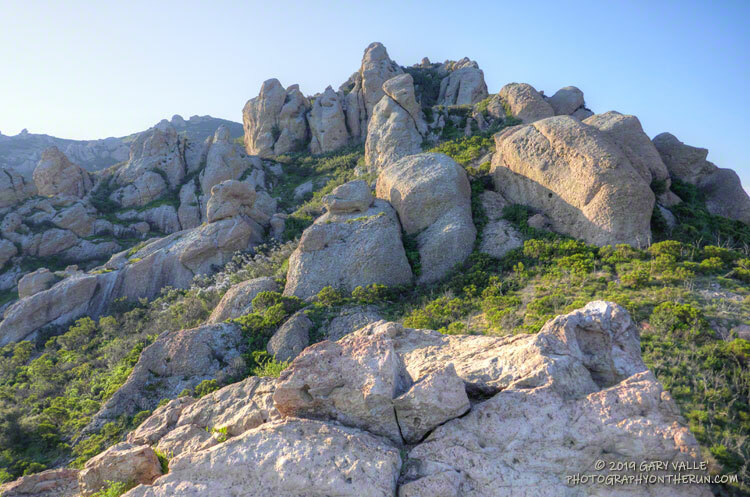 Rock formations near the top of the Chamberlain segment of the Backbone Trail. 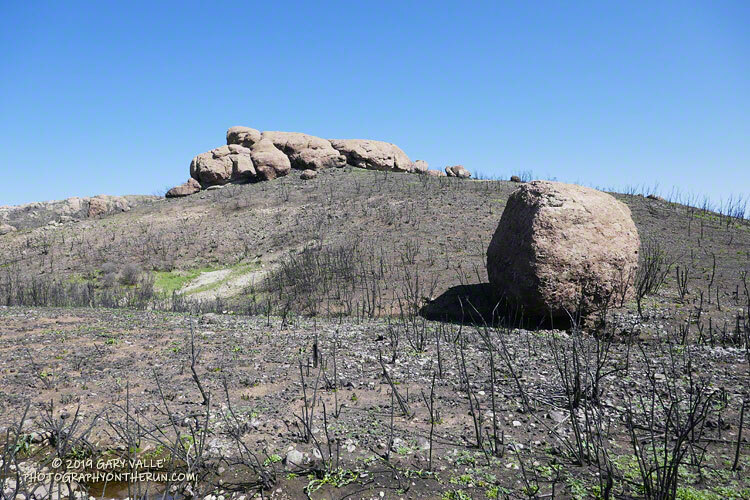 Eroded section of the Chamberlain Trail about a half-mile above Chamberlain Rock. March 24, 2019. 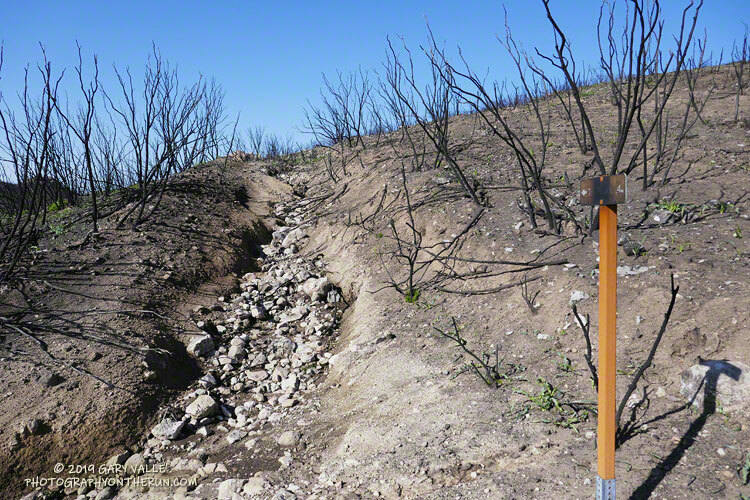 The rate of recovery from the Woolsey Fire varies considerably depending on the habitat, burn severity and geology. March 24, 2019. 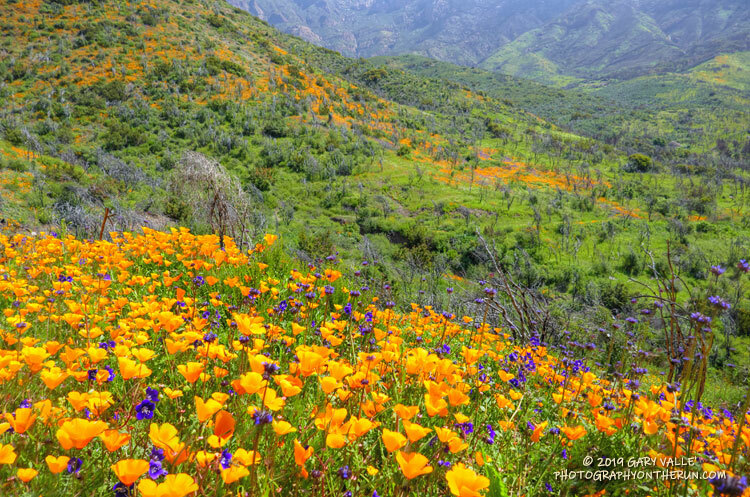 Poppies along the Chamberlain segment of the Backbone Trail. March 24, 2019. 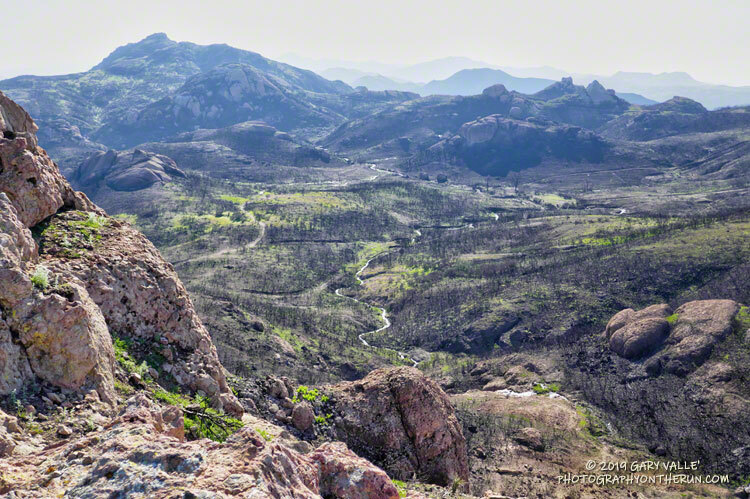 Local trail runners, under the direction of the Santa Monica Mountains Trails Council, recently restored the tread of the Chamberlain Trail from its junction with the Old Boney Trail to just below Chamberlain Rock. 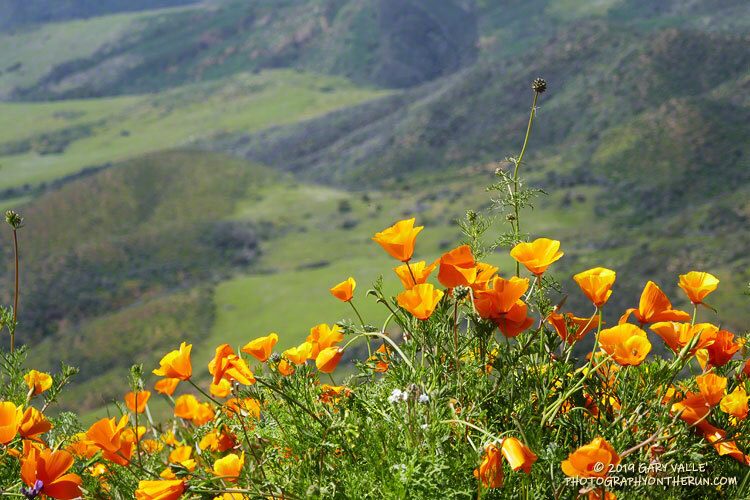 Poppies along the Chamberlain segment of the Backbone Trail overlooking Serrano Valley. March 24, 2019. 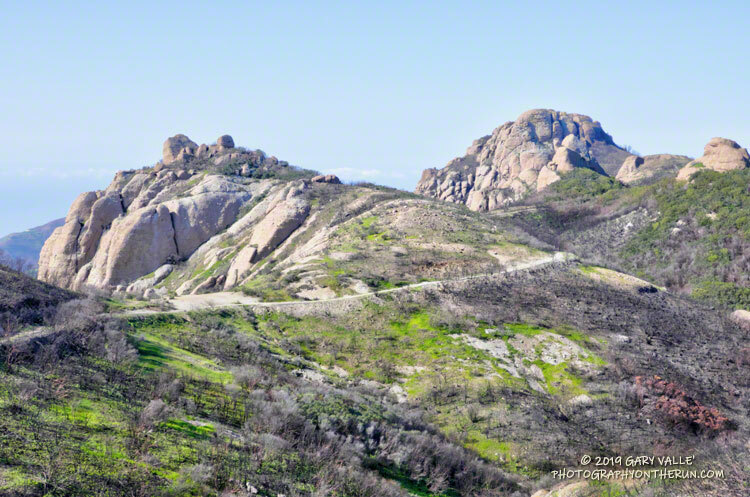 The Chamberlain segment of the Backbone Trail. The Western Ridge/Mountaineer's Route follows along the crest on the left skyline. March 24, 2019. 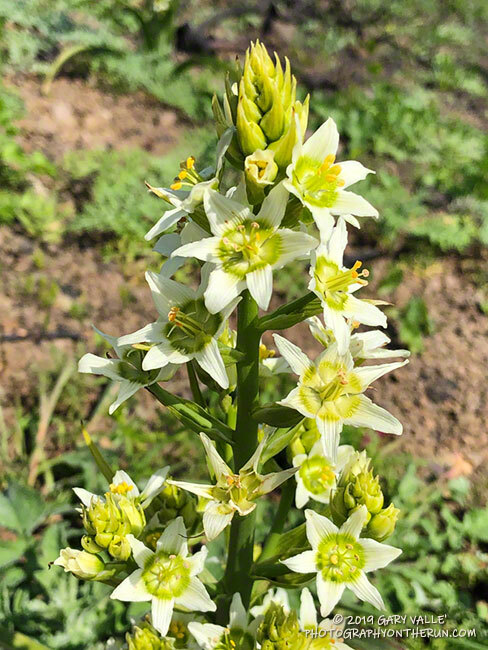 Star-lily, a poisonous plant also known as Fremont's death camas, is a fire-follower and is typically more numerous in areas that have been recently burned. March 24, 2019. 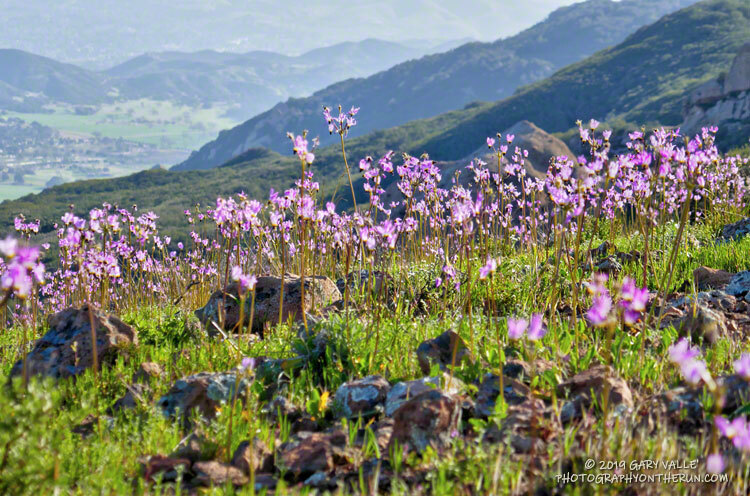 Parry's Phacelia along the Old Boney Trail above Blue Canyon. March 24, 2019. 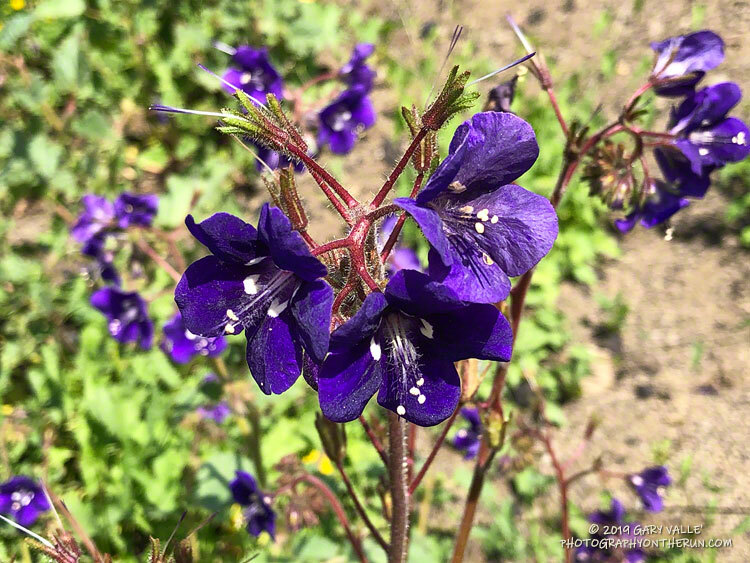 A closer look at Parry's Phacelia. Looking down the Old Boney Trail with the western escarpment of Boney Mountain in the background. The Western Ridge/Mountaineer's Route follows along that crest. March 24, 2019. 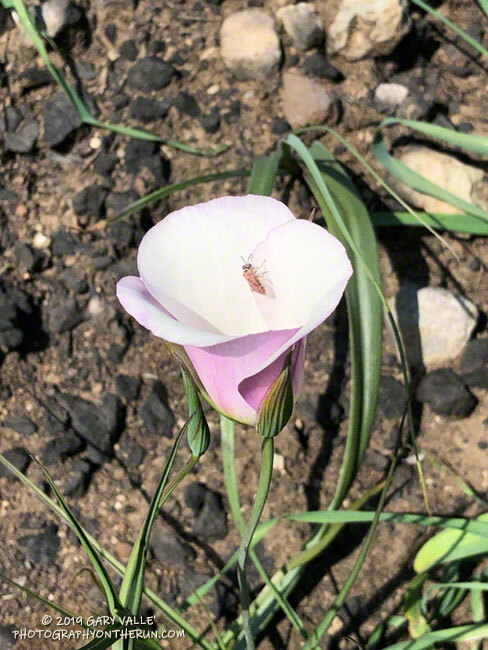 Catalina mariposa lily along the Old Boney Trail. March 24, 2019. 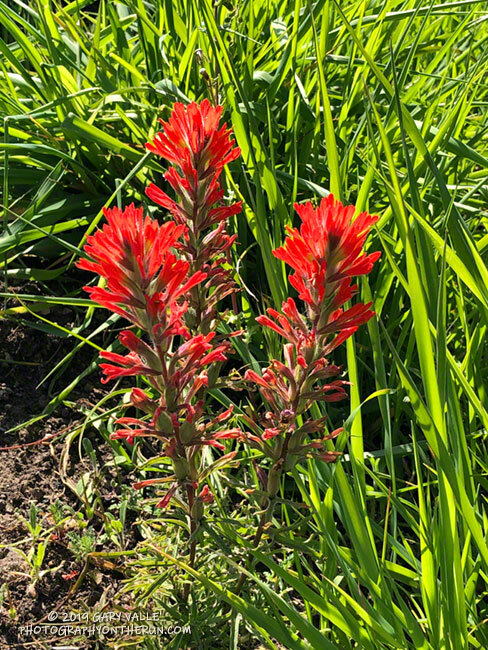 Paintbrush along the Old Boney Trail. March 24, 2019. 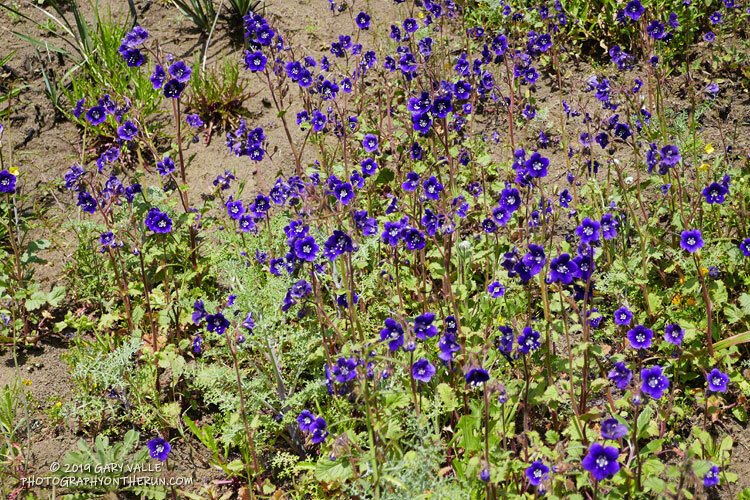 Blue dicks along the Old Boney Trail, above the Blue Canyon junction. 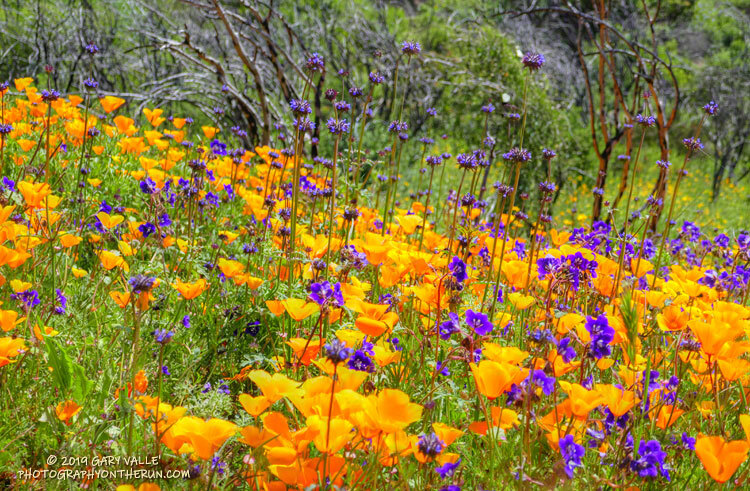 Colorful display of Parry's Phacelia and California Poppy along the Old Boney Trail. March 24, 2019. 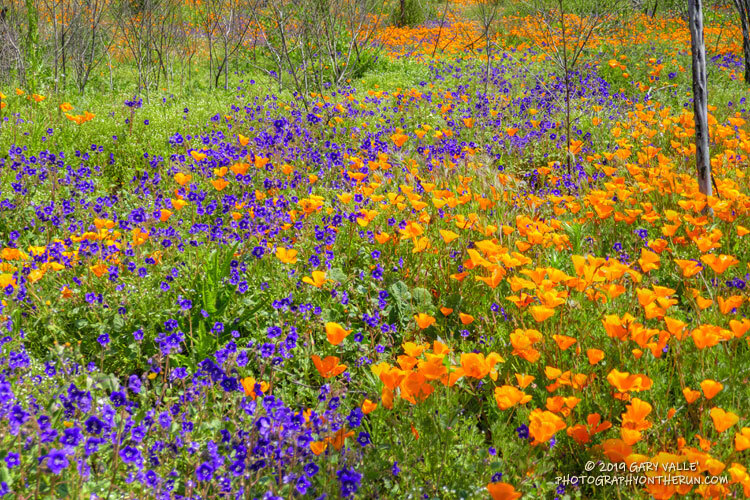 Chia, Parry's Phacelia and California Poppy along the Old Boney Trail. March 24, 2019. 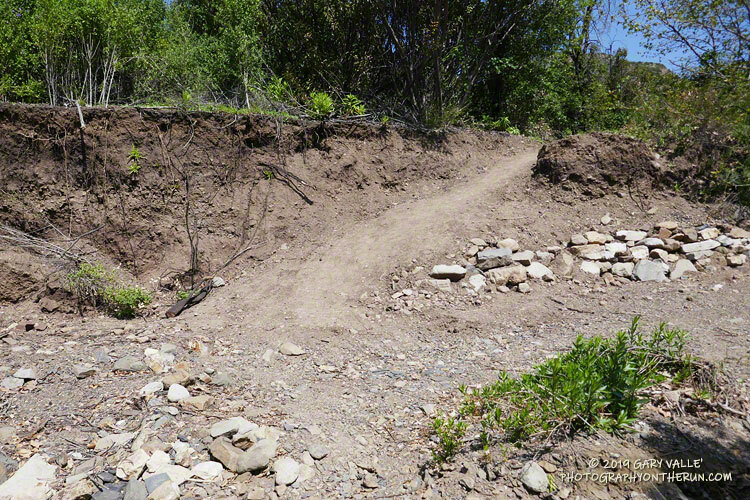 A section of the Upper Sycamore Trail that was recently repaired by the Santa Monica Mountains Trails Council. 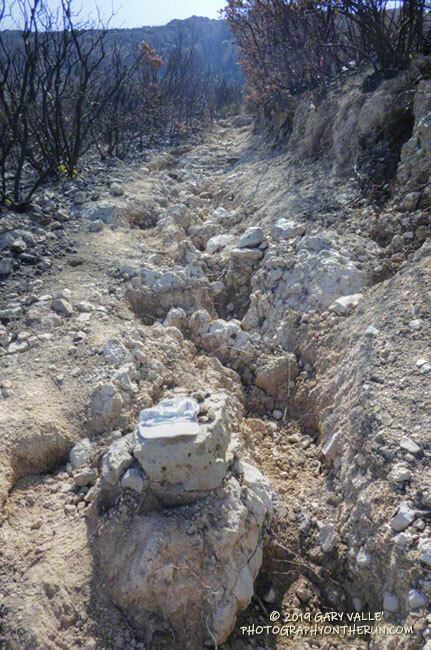 This section also had to be repaired in 2017. 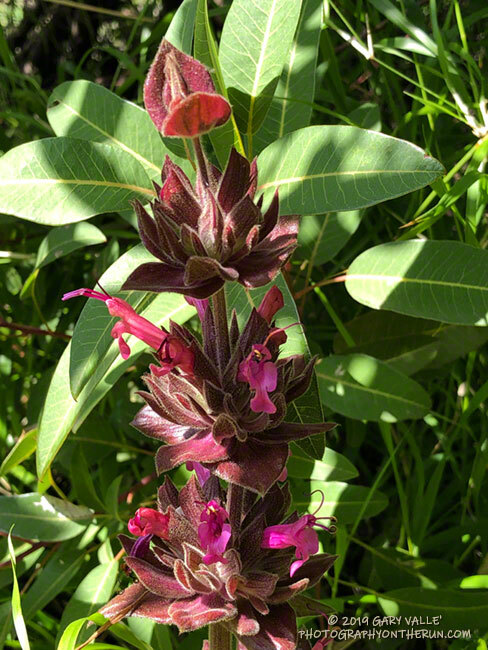 Hummingbird sage along the Upper Sycamore Trail. March 24, 2019. 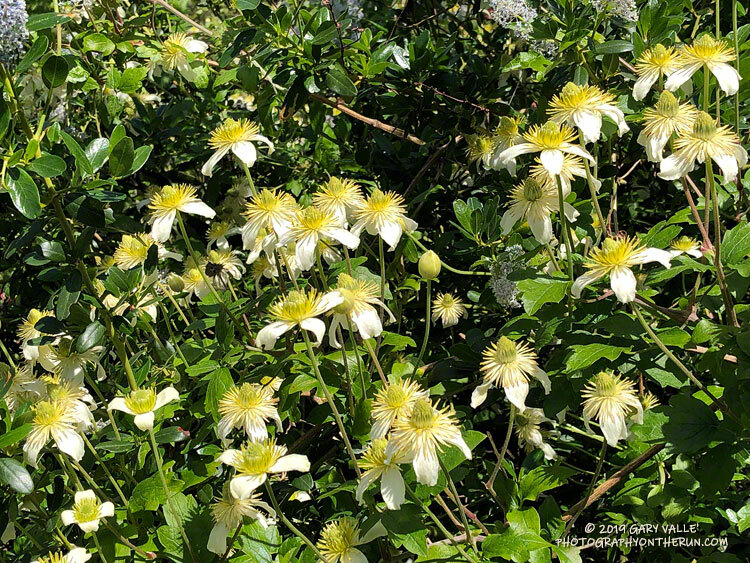 Chaparral Clematis along the Upper Sycamore Trail. 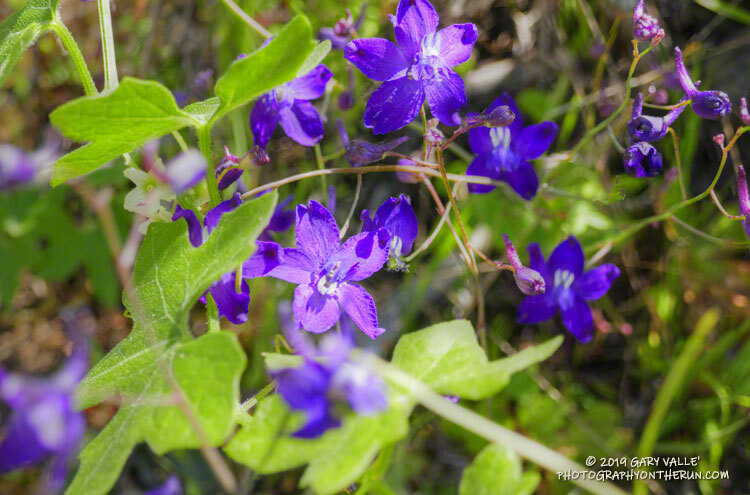 Parry's larkspur on broken shale along the Upper Sycamore Trail. March 24, 2019. Chalk liveforever along the Upper Sycamore Trail. March 24, 2019. 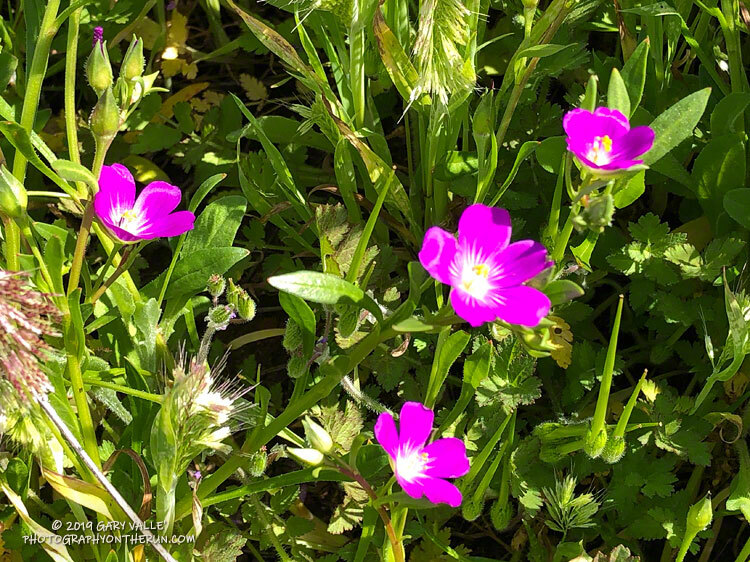 Red maids along a Satwiwa trail, near the end of the run. March 24, 2019.